Bellbrook running back Justin Sloan (35) was named to the Division III All-Ohio Third Team offense. Teammate and offensive lineman Ethan Knisley (not pictured) was named to the All-Ohio First Team. 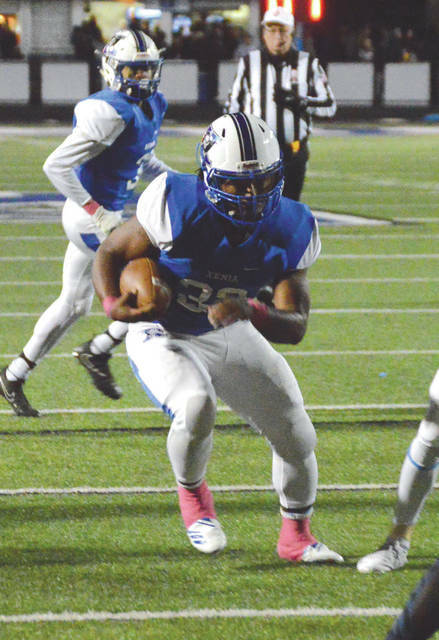 Xenia running back Sincere Wells was one of eight Greene County area high school football players to receive All-Ohio Special Mention recognition this season. COLUMBUS — The Division II through VII football All-Ohio teams have been announced so far this week, and several Greene County area athletes have been mentioned so far. 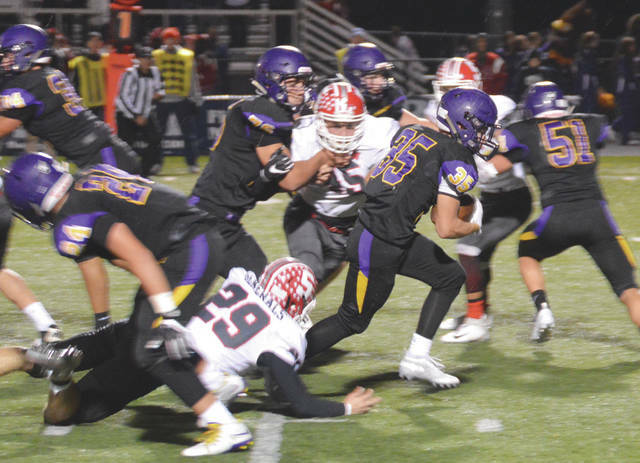 On player, Bellbrook offensive lineman Ethan Knisley, received First Team All-Ohio recognition in Division III, and his teammate — senior running back Justin Sloan — was named as a Third Team All-Ohio selection. The teams were selected by a statewide panel of the Ohio Prep Sportswriters Association. Knisley, a 6-foot-3, 305-pound offensive tackle for the Bellbrook Golden Eagles, was also a First Team selection in the Southwestern Buckeye League as well as an All-Southwest District selection. According to his coach, SW District Coach of the Year Jeff Jenkins, Knisley has received an offer to play football for Urbana University, and has drawn interest from several Mid-American Conference schools. Sloan was named the SWBL’s Offensive Player of the Year for the 2018 season, and was also an All-District pick. The 5-7, 165-pound tailback gained 1,310 yards rushing on 181 carries, averaging 7.23 yards per carry. For his career, he rushed for over 3,100 yards. In Division II, three Xenia Buccaneers and one Fairborn Skyhawk earned All-Ohio Special Mention. For Xenia, running back Sincere Wells, offensive lineman Sam Lockwood and linebacker Nick Willis were named as All-Ohioans. Fairborn middle linebacer Hunter Warner also received All-Ohio Special Mention honors in Division II. A pair of Greeneview Rams earned All-Ohio Special Mention nods in Division V. Rams quarterback Nick Clevenger and running back Clay Payton were both named to the All-Ohio team. In Division VII, running back Brandon Pollock, offensive lineman Caleb Harding and defensive back Hayden Lee represented Cedarville High well as All-Ohio Special Mention selections for the Indians. Each of the area players who received All-Ohio recognition were also selected to their respective All-Southwest District first teams. The Division I All-Ohio team and the Ohio Mr. Football Award will be announced on Wednesday, Nov. 28.
https://www.fairborndailyherald.com/wp-content/uploads/sites/50/2018/11/web1_JustinSloanOHIO_PS.jpgBellbrook running back Justin Sloan (35) was named to the Division III All-Ohio Third Team offense. Teammate and offensive lineman Ethan Knisley (not pictured) was named to the All-Ohio First Team. File Photos. https://www.fairborndailyherald.com/wp-content/uploads/sites/50/2018/11/web1_WellsOhio_PS.jpgXenia running back Sincere Wells was one of eight Greene County area high school football players to receive All-Ohio Special Mention recognition this season. File Photos.